Date for submission of Revaluation of B.Tech S1 (S), S2 (R&S), S3 (S) and S4 (R&S) exam answer books is extended. In view of various representations from students, the submission of requests for revaluation of Answer books of B.Tech S1 (S), S2 (R&S), S3 (S) and S4 (R&S) exams is extended. Additional revaluation requests can be made from 24th September to 1st October 2018. Students can submit the request to College office and College can submit the request to University through Principal Login. Revaluation requests can be submitted for courses for which request is not yet made. Colleges can make final submission on or before 4th October 2018 and payment can be made.Students can apply for answer script copy and revaluation, by registering in the KTU web portal. The Fee for answer script copy is Rs.500/- per answer script and for revaluation, Rs. 600/- per answer script. 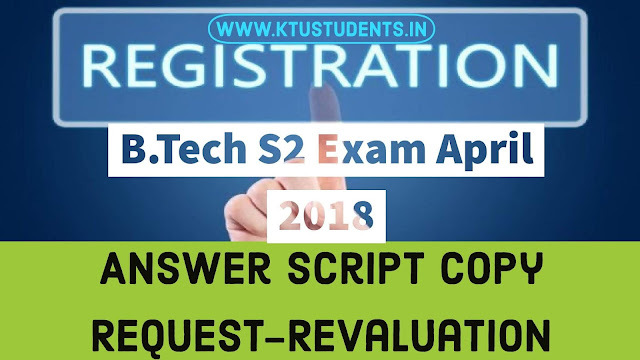 The matter may be notified in the KTU website and necessary permission may be granted in the portal for applying for answer script copy and revaluation.